Talking about Raja Ampat, is definitely talking about the home of the divers. By having 50,000 sq km wide, Raja Ampat is a very huge area to be discovered. It has hundreds of islands and an astounding diversity of habitats, which translates to wildly different diving experiences from pelagic drift dives to special dive habitat in Raja Ampat such as clear water mangroves with corals growing right next to them. There are thousands of potential dive sites in here, and the exploration will still continuing, and on every trip there are chances for new and amazing discoveries. Kri Island: Kri has several sites and Cape Kri is one of the area with most fishes. The fish numbers and variety are truly amazing. The site is current dependent. Generally it's a steep slope with beautiful coral growth, lots of reef and schooling fishes, including the giant Queensland Grouper. Sardine Reef: Sardine Reef has really giant clams at 10m (33ft) but it's all about non-stop fishes here. There's a resident school of bumphead parrotfish in the shallows, colorful soft corals and plenty of critters. The Passage: This is a drift dive through a narrow channel near Waigeo. Look for archerfish among the mangroves, orange cup corals, seahorses, and percula clownfish. Fam Island: Several sites near Fam have stunning coral growth. 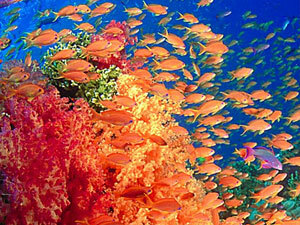 Sponges and soft corals add color and fishes keep it going. Sites include walls, sloping reefs, and muddy bays. Misool: Misool is awash in fish life and huge sea fans. Caverns and boulders mark several sites. The schooling fishes seem endless and pygmy seahorses live in less than 10m (33ft). Some sites are current dependent. Kaboei Bay Rock Islands: The bay is a labyrinth of rock islands. Visibility isn't great but this is a great place for macro and finding odd nudibranches, mollusks and the pictured dragonet. Bat caves and skeletons are found on some of the islands.